CD review: "Big Girl Blues"
This review first appeared in the January 25, 1997 issue of the North County Times. Is America ready for a real, honest-to-goddess female guitar hero? 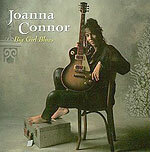 If not, the loss is ours, for Joanna Connor is the goods, equal parts Van Halen and ZZ Top, Buddy Guy and Albert Lee. She adeptly mixes electric blues with a strong vein of hard rock  but it's the blues that wins out in the end, much like what Johnny Winter and Michael Hill have done, only with a little more muscle. Much like her last domestic release, "Fight," a couple years back, "Big Girl Blues" is full of some of the most imaginative and aggressive guitar solos you'll hear outside old Randy Rhodes or classic Van Halen solos. Yet they're wrapped inside music infinitely more interesting than the limited contraints of the heavy metal format. Now, this may freak out some guitar fans: Hearing these outrageous licks and having to accept the fact that they're coming from a woman. Some free advice: Deal with it. You don't get to hear guitar like this too often in this life; only an idiot would let prejudice get in the way of appreciating some of the best guitar playing since Eddie Van Halen fell asleep about 10 years ago. It's also refreshing to hear lyrics about normal, adult life  songs about the challenges and joys of parenthood ("Sweet Baby"), about getting older, about being a woman in a man's world. Connor makes it clear that it's OK to be a real person and still be hip.